This posting is for the three FREE Pungent Pumpkin products. 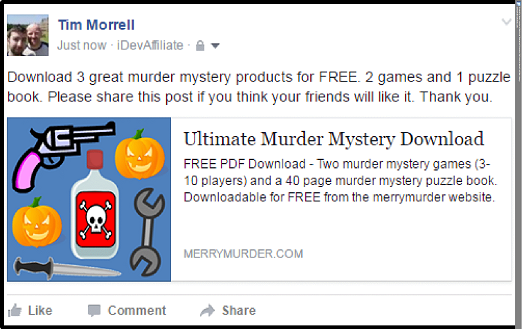 Download 3 great murder mystery products for FREE. 2 games and 1 puzzle book. Please SHARE this post if you think your friends will like it. Thank you. 3 - Click on "Marketing Materials" and then select "Social Media Campaigns"
4 - In the dropdown box select "FREE - All three Pungent Pumpkin Poisoner Products". 5 - Click "Display Social Media Campaigns"
7 - In the "say something about this..." box, you can either paste the suggested text above or add your own comment. 8 - In the drop down box at the bottom, select your audience. Eg "Public"
9 - Click "Post to Facebook"